Here’s more about why a baby may not engage, what’s normal and what’s concerning, and what to do about it. Engagement is one of the first accomplishments of the Cardinal Movement: Descent. Baby’s head needs to lower into the pelvic brim in a way that allows the parietal eminence to slip below the pelvic inlet. Engagement happens when 4/5ths of the baby’s head is in the pelvis. The head is no longer ballotable, meaning, the head can no longer be wiggled between the midwife or doctor’s fingers. 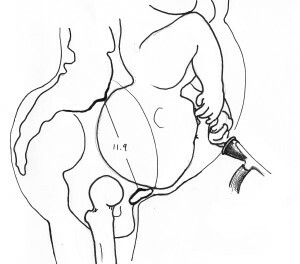 The posterior baby may seem to be fixed in the pelvis like a baby that is engaged. But the overlapping head means the head is not engaged, even though it is not ballotable (bounces in the water when wiggled by the midwife). When the baby hasn’t engaged and the due date is more than 8 days past, baby may be in the posterior position. Of course, some posterior babies do engage. Why wouldn’t a posterior baby be as likely to engage? Less posterior babies have flexed heads (tucked chins). The longer front-to-back length of baby’s head can put the forehead right on mother’s pubic bone. Helping this baby to tuck their chin may help them rotate around and suddenly engage. Whether baby is posterior or not, these techniques may help. They will not move the anterior baby out of a good starting position. Learn how to tell if your baby is engaged in Belly Mapping Workbook. 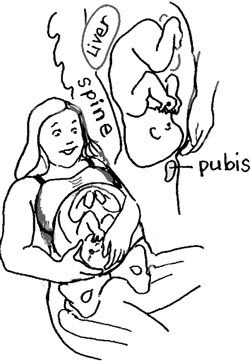 This drawing shows a mother feeling whether her baby’s forehead rests up on her pubic bone or settles behind it. If you feel the narrow forehead here at the time you are due, it is a clue that baby isn’t actually engaged. Add balance and alignment to the pelvis to help baby rotate to drop into the pelvis. A woman whose sacrum is sharply angled may have hours of labor before her baby engages. This woman will have a “sacral bustle” or a “ledge” on the top of her bum. To describe this, I say she could set a glass of water on this ledge, which isn’t really true, but gives the picture. Standing and leaning forward with contractions, in early to active labor is usually what these women do naturally and usually helps engagement. If not, a birthing stool or the abdominal lift and tuck usually help strong contractions bring the baby into the pelvis. From there, the labor usually proceeds rather quickly, as the mother’s hormones are well primed by the long, strong early labor. 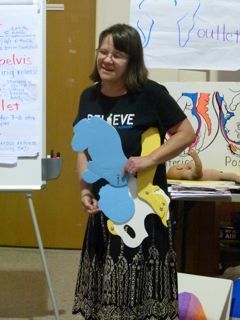 In the photo above, Gail shows the posterior positioned baby resting on the mother’s pubic bone at a Spinning Babies® Workshop in San Diego, California. Circa 2009. Labor may start before baby engages. Sometimes labor seems late to start because the baby isn’t able to enter the pelvis. When labor does start, contractions can be strong without much dilation and the baby remains high in the pelvis. Before the cervix opens well, we need to help baby come down into the pelvis well. Check baby’s position and assist chin flexion and rotation to the LOT or LOA position if possible. Some women are recommended to have an induction, even if their baby is not engaged. Avoid or ease an induction by increasing balance of the maternal structures, by helping baby get chin flexion, if needed, and out of the posterior position, if possible, with balancing activities. See more below. If baby isn’t posterior and earlier labors have gone well, labor will most likely engage baby. If baby is posterior and earlier labors have gone well, labor will also most likely turn and then engage this baby. On the other hand, if labor isn’t starting, do the balance activities discussed in the daily and weekly activities in this part of the website. A mother who had to have her first baby by cesarean because baby didn’t engage (remained high) may be more likely to have a natural birth if her next baby engages, I’ve noticed. Walk briskly with free-swinging thighs. Sit on a birth ball and make circles with the hips. 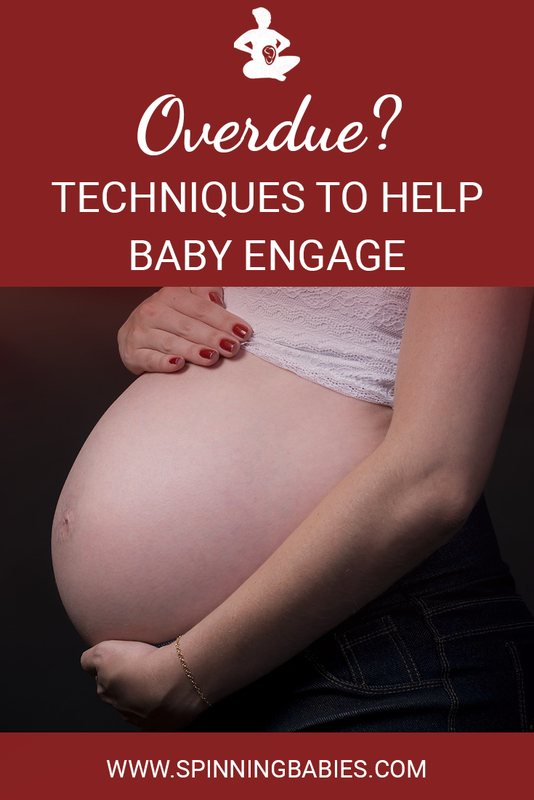 Use engaging activities once labor begins and contractions are predictable (Abdominal Lift). These engaging activities can be done before labor or during labor with bodywork. Sometimes a mother or a mother and her provider can do what is needed to help baby engage before or during labor. Sometimes a bodyworker is best for a particular situation. Sometimes, even with balancing, labor surges are necessary to rotate and engage baby. I’m working with a woman who is about to be induced and her baby is at -2 station, should I suggest Walcher’s? Walcher’s position is only effective with contractions. Don’t recommend it in pregnancy. I’m 39+1 weeks pregnant and still trying to get the baby’s head engaged. It’s currently only 1/5 in the pelvis. Open to any suggestions. I’ve been doing pre-natal yoga all of my pregnancy. And have been doing your Daily Essentials for months. I walk or ride most days. And have been seeing a osteopath regularly. Being my first pregnancy I was very surprised that my labour was only two hours. I had done the Daily Essentials and prenatal yoga most of my pregnancy, and believe that this aided in my perfect birth and our baby being in the most perfect position to birth so easily. Babies naturally engage in the pelvis when the broad ligament is soft enough and the brim open enough. Fetal chin tucking and coming down from the mother’s left side helps more babies fit more mother’s inlets. Generally, we hope for flexion and rotation before engagement. This is most important when we find baby in the posterior position and high after 38 weeks pregnancy when pregnant with a first child, or going for a vaginal birth after a previous cesarean. Work on Balance before working on rotation and descent. Sometimes we have a time issue, as when a woman’s membranes have released and when her provider has a time limit for her labor. Descent from a non-optimal position may have additional challenges that may be met with maternal positioning and activities in labor. Fetal engagement may help the onset of labor be more spontaneous. For a woman in labor, check out information and techniques to help the baby engage. Haberman, S., et al. “OP22. 08: To evaluate the value of the determination of occipito posterior position before head engagement and risk of persistent OP and Cesarean section.” Ultrasound in Obstetrics &amp; Gynecology 38.S1 (2011): 121-121. (Before engagement, 76 (43%) fetuses were in occiput posterior position (OP), but 67 (88%) of them rotated to occiput anterior (OA) during labour. Eleven (6%) fetuses were delivered in OP, and 9 of them were in OP before engagement (P &lt; 0.001). 22.4% of cases in the OP group underwent Cesarean section compared to 12.7% of controls (P &lt; 0.001). Shaikh, Farhana, Shabnam Shaikh, and Najma Shaikh. “Outcome of primigravida with high head at term.” JPMA. The Journal of the Pakistan Medical Association 64.9 (2014): 1012-1014. (The most common identified cause of non-engaged head was deflexed head in 28(28%), while no cause was found in 45(45%) women. Further, 45(45%) women presented with spontaneous labour, while labour had to be induced with prostaglandin in the rest. Vaginal delivery occurred in 59(59%) cases and caesarean section was performed in 41(41%). Verhoeven, Corine JM, et al. “Does ultrasonographic foetal head position prior to induction of labour predict the outcome of delivery?.” European Journal of Obstetrics &amp; Gynecology and Reprod Biology (2012). Roshanfekr, Daniel, et al. “Station at onset of active labor in nulliparous patients and risk of cesarean delivery.” Obstetrics &amp; Gynecology 93.3 (1999): 329-331.iology (2012). Best outcomes for first time mothers with unengaged babies were found in this 1999 study: Roshanfekr, Daniel, et al. “Station at onset of active labor in nulliparous patients and risk of cesarean delivery.” Obstetrics &amp; Gynecology 93.3 (1999): 329-331.